ELEAGUE, the premium esports content and live tournament brand from Turner and IMG, has added TEKKEN® 7, the storied 3D fighting franchise from BANDAI NAMCO Entertainment America Inc., for the first-ever ELEAGUE | TEKKEN Team Takedown. The addition of TEKKEN® 7 further expands ELEAGUE’s collection of popular esports titles. 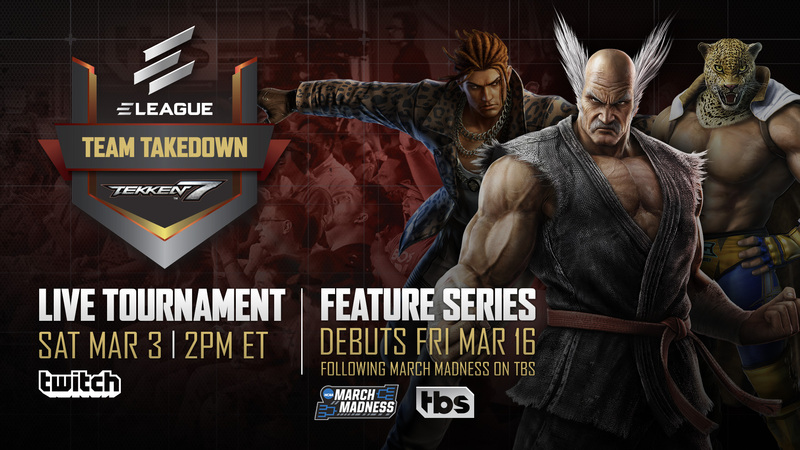 TEKKEN Team Takedown will begin with a live tournament Saturday, March 3, at 2 p.m. ET, exclusively on Twitch. Coverage of the event will then transition to TBS for a four-part feature series set to premiere Friday, March 16, following the network’s NCAA March Madness coverage. Format & Tickets for Live Tournament at ELEAGUE Arena, Saturday, March 3, at 2 p.m. The live TEKKEN® 7 tournament will feature 20 of the game’s top American players competing on four teams in a single-elimination bracket, with live coverage beginning Saturday, March 3, at 2 p.m. on Twitch. Team matches will consist of a series of one-on-one games, with losing players eliminated from future competition during that match. A team will win a match when it eliminates all available players from the opposing team. Fans can be a part of the live studio audience inside ELEAGUE Arena at Turner Studios in Atlanta by reserving free tickets here. Studio audience members will be entered into a raffle with prizes including an ELEAGUE-branded gaming chair, HORI TEKKEN® 7 Fight Stick and ELEAGUE gift bag. ELEAGUE will take viewers on an all-access tour of TEKKEN® 7, revisiting the best moments and matches from TEKKEN Team Takedown on the ELEAGUE stage. The four-part feature series will premiere Friday, March 16, following NCAA March Madness coverage on TBS, with additional episodes airing weekly on Fridays. A team of seasoned Fighting Game Community experts will join ELEAGUE host Richard Lewis to call the live action as well as provide studio analysis and player interviews. 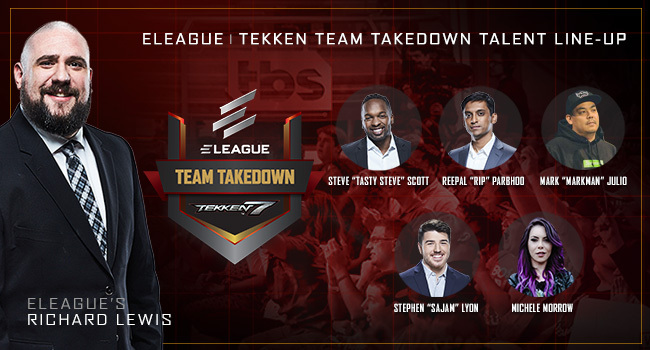 The casting team will be featured throughout the live tournament and TBS series, and includes Reepal “Rip” Parbhoo – currently ranked in the top 20 on the TEKKEN World Tour – Steve “Tasty Steve” Scott and Stephen “Sajam” Lyon. In addition, TEKKEN ambassador and analyst Mark “MarkMan” Julio as well as reporter Michele Morrow will both make their ELEAGUE debuts.